Important: These are not plans for making this yourself. These are the directions that came with this trick when it was on the market for $2695.00 in the early 2000s. This PDF is designed for collectors who may have the prop, but no directions, magic historians, and those simply curious as to how this trick was done. The trick still shows up on eBay, magic flea markets and auctions. Effect: Are you tired of floating boards that a girl just happens to be laying on? Too many suspensions and levitations suffer from this weakness. The supports are removed and the board floats along with the girl. NOT ANYMORE! Our Dev-Ray breaks new ground. With Dev-Ray the girl first lies on the board... and then floats up off the board! Look closely at the top of the table. 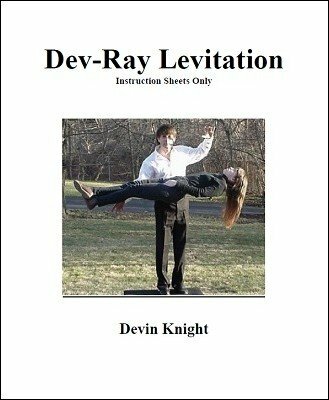 You will see it's the thinnest ever made for a levitation, Next look at the girl and notice underneath her. Her legs are bent and arched. No apparent place for any type of support. Note the girl does not wear any type of harness underneath her clothes. She can be in a tight skimpy outfit as no flowing clothes are needed to hide the support. This support is one of the smallest made, yet will support up to 250lbs. Can be done on stage or outdoors. If you have assistants they can roll away the table leaving you with a girl floating in mid-air with no visible means of support and NO BOARD underneath her! Completely under your control, and yes you can pass an ungimmicked hoop over her to prove no hidden supports! Worth buying to see how this illusion worked.